Do you, Boo. — The Busy Bee Productivity Coaching, LLC. 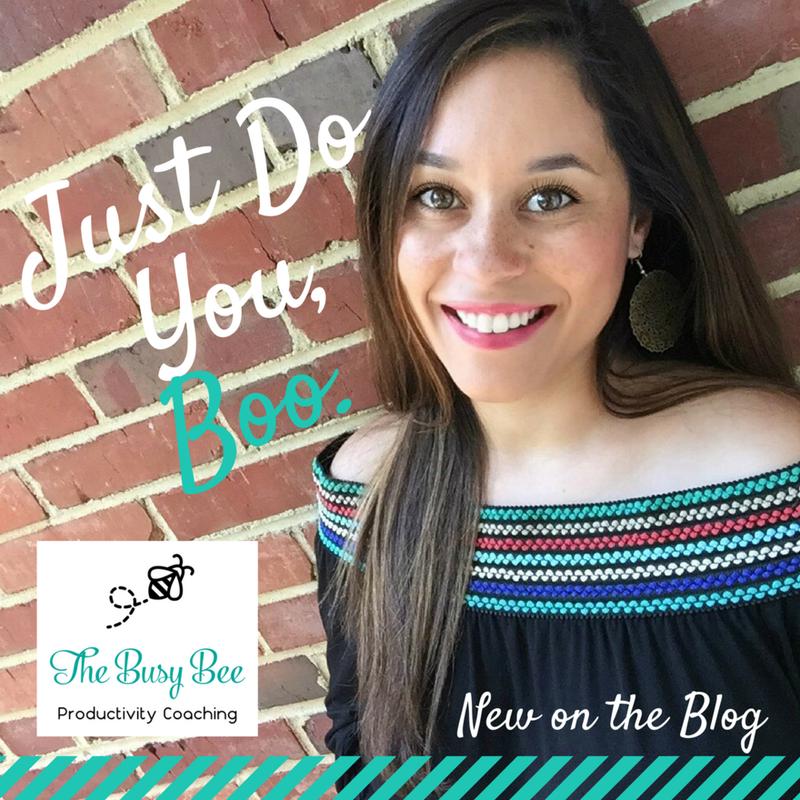 That's right...the theme for this week's blog post is, "Do you, Boo." It sounds silly but in all seriousness, how many of us are caught up in what other's think of us?!? How many of us are constantly comparing ourselves; our life, our business, our relationships, our careers, to others?!? I was absolutely terrified of going back to school, becoming an Arbonne consultant and most of all, starting a coaching business. I worried a lot about what other people would think about what I was doing. Do they think I can't handle my teaching job? Do they think I'm bored and have nothing else to do? Do they think that I need attention? Are they rolling their eyes at my instagram posts and blogs? I am definitely a people pleaser (can anyone relate?!) It can be scary to go off the beaten path of what everyone expects of us. What I've come to realize is that it doesn't matter what other people think. It's your life, your choices, and your reality. Often times, it can be the people closest to us that we are most afraid of "hurting." We wonder what they will say or think about us. Sometimes we might even feel selfish. It can be so scary to go down that negative mindset rabbithole....but I know I'm not alone in this. What I've come to realize is that I'm a better wife, teacher, friend and daughter when I say yes to the things that make me happy. It doesn't matter what other people think. If something fails or I make a mistake, I'm learning! It can be so scary to get out of your comfort zone but what's scarier to me is staying stuck. Settling into a life less than the one you are capable of living. "The only way to get what you've never had, is to do the things you've never done." How powerful is that? If we stop comparing, stop worrying about what others think, incredible things will happen. "When you find yourself looking at someone else and wondering why you aren't as smart, pretty, successful, etc., just STOP! Take a breath and look inward. Learn to recognize the unique, glorious person you are at this very moment, and then ask yourself what you want, and what feels good for you in the moment. Aligning with your own truth in each moment will help you become who you want to be. In essence this means you allow yourself to be your true self. Just do you." Whether it's goal setting, a career change, moving to a new place, or just starting a fitness routine- change can be scary. Thinking about what your friends and family might say behind your back can be scary. Comparing yourself to others only steals your joy. and everything else will fall into place! Shannon Kaiser also says in her book, "You are the light; you have dreams, goals, and aspirations that are part of YOU. And when you align with those, you realize that you are on your own path." She also talks about aligning with your WHY. We also talk about this a lot in Arbonne, also. Your WHY needs to be bigger than your excuses. Your WHY is what should get you out of bed in the morning. If you find yourself getting stuck or getting into comparison mode throughout the day, Shannon says to "align with your WHY. Ask yourself...Why am I doing what I'm doing?" Set those goals. Create a "mission statement." Journal your dreams. Dare to dream big. Just remember those who matter will love and support you no matter what. Don't settle. I hope you found this blog post helpful and inspiring! If you're ready to take a leap and see some real changes in your life, with accountability and positivity, send me an email! I'd love to hear from you! And just remember-Do you, boo! You are the light; you have dreams, goals, and aspirations that are part of YOU. And when you align with those, you realize that you are on your own path.